In the end it was a week of two halves. Thursday enticed us in with an odd shock for the big guns, while Tuesday had a feeling of returning back to business, effectively narrowing the field as we head into the final three matches of World Cup qualification. While there were so many worthy talking points across Asia, Martin Lowe looks back on three areas of interest in particular, the good, the bad and the indifferent, in a campaign that continues to generate interest, inside and outside the continent. The writing was on the wall. As we previewed last week it was do or die for UAE ahead of two defining challenges; at home to Japan, before travelling to Australia. Go through this week undefeated and they’d be back in the hunt for qualification ahead of a more favourable run in than their competition, but lose out and the dream would be effectively over with a coach on borrowed time. The latter, always the more likely route, became reality, ending with Mahdi Ali handing in his resignation minutes after the defeat in Sydney. The pressure had been growing, for almost a year in reality, on the once beloved Ali, who groomed this current golden generation through the youth levels to an Olympic Games and to a highly successful third place at the last Asian Cup. Success is fleeting, and memories in football are equally short lived. Ali slowly lost respect from the Emirati fan base; too ridged towards his preferred set of tactics, remaining ever loyal to a small cohort of players and crucially in the end not picking up the desired points. Who'll be coaching their national team for the last time today? The golden generation tag, as can be attested to by English, Belgian and Ivorian fans over the last decade, is a dangerous label that rarely bears fruit. With UAE’s failed World Cup qualification campaign and Mahdi Ali’s resignation, another example can be surely added to that list. And while Ali has copped much of the flack over recent times, the players are finally starting to hear the criticism in the wake of their mentor’s exit. Over both matches this week UAE were dished out a lesson of professionalism, invention and class that the Emirati have struggled with throughout this campaign ever since their promising start in the Saitama Stadium in match day 1. While the tactical battle was clearly lost, not for the first time, the players in the system didn’t do themselves justice either. Key questions need to be posed at Omar Abdulrahman, Ali Mabkhout and the like, who had the opportunities but failed to up their game against Asia’s very best. As we’ve written many times before, Amoory remains the best talent Asia has to offer, but it’s getting to a stage where if he doesn’t move to Europe soon he can’t be considered a true great. He almost single-handedly wins games domestically and in the Asian Champions League, but it’s no coincidence that he can’t conjure the same magic against the top players who ply their trade in Europe. The same goes for Mabkhout, who continues in a rich vein of form for Al-Jazira, but has found it difficult to replicate his Asian Cup form in the big qualification games. Omar Abdulrahman sparked in glimpses against Japan and Australia, but that was it, more of a novelty act than a likely avenue towards goal. He was left frustrated by a more than lenient referee in Sydney, but that being said, he chose to sulk rather than up his game in the final third. Mabkhout just had an off week, seemingly lacking confidence as he spurned a one-on-one in the first period against Japan (striking it straight at Kawashima) and in Sydney, let a promising opportunity go for a bad first touch. 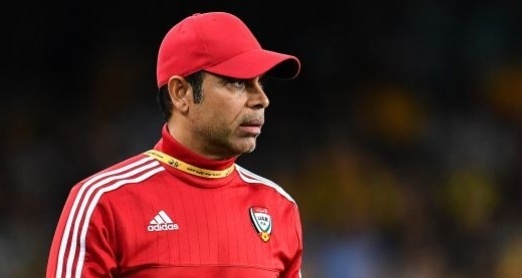 A change is definitely needed in the dugout, and for all the good Mahdi Ali has done over the developing years of this group, his time has come to depart. In his wake, however, the players need to step up to the plate. In this regard one or two desperately need to move to Europe; if this is the golden generation to remember, they need at least one pillar of quality that is playing their football at the biggest stage, and pressure needs to be squarely pointed at Omar Abdulrahman. We’re under two years away from a home Asian Cup, that UAE need to compete at the sharp end of. The question remains however, will this be the golden generation’s finest hour, or represent another missed opportunity. A year ago, I proposed that Australia were out in front as Asia’s top national team. They had it all; attacking fluency, defensive organisation and a tactically flexible coach. Some miserable results to end 2016 and start this year have lowered the stock in this argument quite considerably, that of course alongside the juggernaut that is Iran, who continue to ramp up their cause in all three respective regards, effectively guaranteeing qualification to Russia after a stunning 12 month campaign. Carlos Queiroz’s men were always the go to team in Asia in terms of defensive solidity, but it could be argued that they’ve even surpassed their own high standards over the last year. Their Round 3 sheet remains spotless, only England can replicate this across the World in final round qualification. Team Melli have now gone 17 months without conceding a goal, ever since Mekan Saparow scored back in November 2015. It’s no mere fluke built on the performances of individuals, as was the case in this recent round of fixtures; with Queiroz making two changes to his defensive lineup that continues to look solid and unfazed, regardless of the team sheet presented. But it’s in attack where we’ve been most impressed by the improvement, long an area which has caused concern for the Persians. On the back of the Asian Cup, we started to see the qualities of Sardar Azmoun, but the assumption was that he’d have to contend with the goalscoring burden alone. However, the improvement in their club fortunes in Europe of Karim Ansarifard, now at Olympiacos, and Reza Ghoochannejhad at Heerenveen (Emirati players, take note) have finally paid dividend for the national team that now boasts three in form strikers playing at the top level of European football, two of which have also been amongst the goals in elite European competition. Alongside a devastating trio of forwards, the quiet progression of Mehdi Taremi has gone by largely unnoticed, but the Persepolis man was set in the limelight over the last week. Shifted out to the left predominantly, Taremi was the only player from Iran’s four strikers to start both games, offering something unique to his goal poaching peers – an eye for link up play, the willingness to work back and great off the ball movement to create space. His fine double over the week was richly deserved, with Taremi establishing as the difference-maker that pushes Iran ever closer to their first back to back World Cup appearance in their history. Last time out in Brazil, Iran were forced to sit and consolidate what they had, admirably defending for large parts due to a lacking strikeforce. Many at the time put much of the praise on the organisation of Queiroz, but come 2018 they’ll be a different challenge for those drawn against Team Melli. With an ever plentiful stock of talent in attacking areas, it’s notable that Iran look Asia’s best bet of contesting for a knockout stage finish in Russia, with more than just a tactically aware coach to call upon. In a confederation full of uncertainties, one trend has long been emerging; that of a choking Uzbekistan side. Every Asian Cup or World Cup qualification phase, we head into it pinning the dark horse tag to the Uzbeks, to initially be proven correct with a usually promising start, but inevitably when it comes to the crux of the campaign they fall away with a whimper. The Road to Russia looks to be heading in the same direction, and while they restored order by beating Qatar 1-0 in Tashkent on Tuesday, anyone that endured that performance will be fully aware that they’re a considerable distance behind Asia’s elite. FT Syria – Uzbekistan 1:0. What a wasted chance from Uzbeks. Cue "chokers" remarks yet again. Al Khatib the talisman for Syria. The headline grabbing story of this week (at least outside of Asia) was the fairytale victory of Syria, scoring late on in their adopted home for the qualifiers in Malaysia to beat Uzbekistan on Thursday. Prospects of Syria usurping Uzbekistan for a playoff berth remain slim, ever more so since their loss to Korea (albeit narrowly) on Tuesday, but given the country’s state at present, neutrals the world over are flocking behind their unlikely success story which shows passion in adversity but on more than one occasion plenty of quality. Uzbekistan, on the other hand, look a pale imitation of the side that started Round 3 qualification, winning three of their first four (losing only to Iran) and only conceding one goal across that period. They were solid, effective from set plays, but admittedly blunt in attack, and that’s where the struggles of the last week have come in. Igor Sergeev, once one of the most potent strikers in Asia, has seemingly lost all belief in his own abilities since an ill-fated loan spell in China last year. Sardor Rashidov – impeccable at club level in Qatar – fails to replicate such performances for the national team, and through the next generation of Dostonbek Khamdamov, Eldor Shomurondov and Djamshid Iskandarov (remember him? ), something has clearly gone amiss, as none have been able to fully instil themselves in the starting lineup. The same old reliance on the elder statesmen of the team, Odil Akhmedov and Server Djeparov, is proving stale and predictable, the latter of whom is far past the stage of being able to win games single-handedly. In an attacking sense, the most fruitful avenue has been via the substitute appearances of fellow veteran Aleksandr Geynrikh, something we’d all have been laughing at two years ago when this supposed promising batch of youth was on an upward trajectory. The Qatar match was one of the worst matches I’ve recently seen, even more so given some of the quality we’ve seen in this latest round of qualification. Qatar can be forgiven somewhat, in transition and all but mathematically out at the start of play, but Uzbekistan, for a side that are still primed to make the playoff stages, it’s a sad indictment on Asian football. Samvel Babayan pulled out an Alan Pardew-esque jig at the end of the match, a wide smile illustrated the importance of such a victory in a match that neither side deserved to win.